Posted on Tue, Jan 17, 2012 : 5:58 a.m.
Food service companies are setting their sights on the Dexter Plaza shopping center at the corner of Dexter Ann Arbor Road and Ryan Drive. The plaza, which is anchored by a Busch's grocery store, will get a new Subway sandwich shop after a franchisee for the national chain signed a lease to take over the space previously occupied by Arizona Tanning, which closed last year. Two food service companies recently signed deals to lease space at the Dexter Plaza shopping center. Separately, the plaza's Wags to Whiskers pet store recently closed — and half of that double unit has already been leased out. Though the new tenant has agreed to the terms and conditions, a representative for Bloomfield Hills-based AF Jonna Development LLC, which acquired the plaza six months ago, would only say that it's a food service business. “It will be very well received in the market, and it’s a good fit for the other tenants there,” said David Lord, director of leasing for AF Jonna Development. The Subway franchise plans to file for building permits within the next couple of weeks but won't open for at least four months, Lord said. With those deals done, the plaza only has 1,437 square feet available for leasing: the other half of the Wags to Whiskers space. The Dexter Plaza is valuable retail space, Lord said. “The strength of Busch’s is a tremendous asset. We want to be good neighbors to them and they are good neighbors to us," he said. Although Busch’s owns its own building, it shares an easement agreement — and the combined 65,141-square-foot shopping center is considered a cohesive development. AF Jonna, which also owns the building at 1220 S. University in Ann Arbor, would like to acquire more commercial real estate in the Washtenaw County market. With retail moving online, what else is supposed to be in these malls? While we are on the subject a Cracker Barrel in Washtenaw county would be nice. Thu, Jan 19, 2012 : 12:19 a.m.
@huh: Dexter has two sporting goods stores, Dexter Bike &amp; Sport is on Baker and Mill Creek is on Main by the A&amp;W.
Wed, Jan 18, 2012 : 1:48 a.m.
What is a &quot;local fresh food restaurant&quot;? Local doesn't mean organic and local does mean lack of vegetables in the wintertime due to our growing season. Of course, local meat and eggs would be available..but man cannot live on meat alone. I would like to see a Dexter restaurant with decent food that doesn't cost $14 a plate. Wed, Jan 18, 2012 : 12:14 a.m. I think a nice alternative would be a local fresh food restaurant - with take out &amp; cooking lessons. Could be very local and reasonably priced. How about a unique sporting goods store. Dexter has alot of health conscious people, hunters ,bikers , runners. Tue, Jan 17, 2012 : 9:42 p.m. I don't actually go to Cracker Barrel that much mainly because they are ALWAYS packed on Sundays! There for they would employ many more than another Subway! And your choice would be? I hope not another $25 a meal rip off. Tue, Jan 17, 2012 : 7 p.m.
Tue, Jan 17, 2012 : 5:28 p.m.
Mon, Jan 23, 2012 : 2:31 a.m.
Part of the struggles at the Country Market plaza have to do with its extremely unfriendly layout. It's surrounded by houses on both sides of Dexter-Ann Arbor Road. Yet, getting into the plaza from the Ryan Drive side on foot requires taking your life in your hand to get across the road, where drivers routinely ignore stop lights and pedestrians, and wend your way along a circuitous path through snowbanks to get to the bizarre single pedestrian entrance over by Country Market. It needs not only a face lift, it needs its relationship to the road completely revamped so that it can be easily reached! I agree, lets hope Dexter doesn't become a larger city overrun by large stores - they would also bring the things we try to keep down; big box competition, chains and crime. Better to keep Dexter a uniquely flavored town. More Milford-ish, less Ann Arbor. Well, heck, let's just make it look like Ann Arbor, or Livonia, etc.. Why is it that some of the people who move to a small town end up making it just like the town they moved away from? Justcurious - not to mention, the center of town gets pretty congested already and there isn't much opportunity to widen that portion! Tue, Jan 17, 2012 : 6:59 p.m.
Target or Big Box?? Never!! At least until I'm gone. No big bookstore chain either please, unless it would be a Nicola's. I would love an old fashioned dime store where you could find the necessities that we end up driving out of town for. But those days are long gone as well. Tue, Jan 17, 2012 : 5:20 p.m. Wed, Jan 18, 2012 : 3:02 a.m.
Dexter had one. Lighthouse had its own smoker and grill. Great pulled pork sandwiches and such. It didn't receive a great response in the resturant setting, but the previous owners now offer a catering service, once they left the Lighthouse location. Tue, Jan 17, 2012 : 7:19 p.m. I would say yes, apparently SubWay is in demand to that extent. People who run businesses aren't that dumb. Tue, Jan 17, 2012 : 6:55 p.m. I do like Little Porky's ribs. They have one in Whitmore Lake and one on Dexter Rd. in Ann Arbor. They don't need much space to operate. Tue, Jan 17, 2012 : 5:04 p.m. Wish is was something other than a Subway, and I cannot imagine the folks at Mr. Pita are none too thrilled, but such is the nature of competition. Dexter is doing really well and I hope people realize is for 3 reasons: 1. Good local government (because they do try) in the Village and Townships 2. Its residents who participate in government (so when the folks get it wrong, as they do sometimes, they can get back on track) and who care about the community they live in and their neighbors, 3. The excellent schools we have. Folks have always really tried to care about their community here and I think it shows. Wed, Jan 18, 2012 : 1:50 a.m.
Tue, Jan 17, 2012 : 4:07 p.m.
Sure it would be nice to see something other than 'another' Subway, but let's look at the positive. Dexter is doing great! It has a wonderful small town feel, a lovely downtown (with nearly full occupancy), and a handsome new bridge with a nicely developing Mill Creek waterfront......add to this it's new library, it's close proximity to the hustle and bustle of Ann Arbor (as well as natural areas at the Metroparks) , and its funky restaurants (the Red Brick is AMAZING).....its no wonder that things continue to look rosy for Dexter. Soon, a pathway will be completed allowing one to hike or bike to Hudson Mills without seeing a car! The 'Country Market' shopping center IS a mystery. I speculate that it's struggles are a combination of many factors --- poor site planning, uninspired architecture, and general financial misfortune which has snowballed. It would be GREAT to see a major retailer/restaurant move in and turn the tide -- one positive ADD to the shopping center could do wonders. 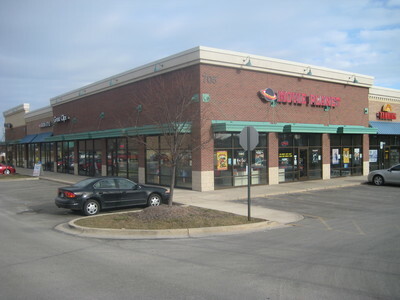 Tue, Jan 17, 2012 : 10:30 p.m.
First a subway..what next Walmart..good grief hope not. Tue, Jan 17, 2012 : 3:46 p.m. Interesting. Similar to Dexter, the shopping center that Country Market anchors in Saline is quickly becoming a ghost town. Negotiating may not always be the best strategy. If you cut your rents and sign a 5 or 10 year leease, and rents start to go back up, you are stuck LOSING money. Sometimes it is better to let something sit vacant for a year, to make more money over 10. Of course, you could offer the owner money, buy it and allow $1 a sq foot rent if you feel it will bring people there. Tue, Jan 17, 2012 : 4:14 p.m.
Yeah, I've heard the same regarding Saline's landlord. It's just interesting that Country Market is the common denominator. Yes and in Saline it has to do with a Landlord not negotiating in this economy! Right across the street from this location, places are being snapped up, because THAT landlord will wheel &amp; deal in these hard economic times. I guess EMPTY buildings pay a lot, insert sarcasim! Tue, Jan 17, 2012 : 3:37 p.m. I agree, Dexter does not need another Subway. How about Schlotzsky's, PotBelly, Jimmy John's, Panera, Zoup!, Au Bon Pain or Noodles &amp; Company? Tue, Jan 17, 2012 : 10:48 p.m.
You are free to op[em one of hose as a franchisee. Why is it people complain about a business moving in just because THEY do not like it. If there was some huge demand for Jimmy Johns in Dexter, gather some cash and open one. There seems to be a guy who probably spent some money and did some market research and thinks Subway is a better investment. Tue, Jan 17, 2012 : 6:52 p.m.
Jimmy Johns would be great! Tue, Jan 17, 2012 : 3:43 p.m. I really, REALLY miss Schlotzsky's. Tue, Jan 17, 2012 : 3:24 p.m.
Wouldn't this have been more appropriately placed in an advertising section, for rent, of a2.com and paid for, than written up as news? This is big news in little Dexter and we are happy to hear about people investing in our community - can't you tell by all the comments on this article? It's still small town where everyone wants to know what's going on. Tue, Jan 17, 2012 : 7:17 p.m. I disagree. Business changes are news, and are one of the reasons for a newspaper. Tue, Jan 17, 2012 : 3:17 p.m. I think that Country Market location is the only one you point to where there are vacancies. I think that's more due to difficulty with that particular location and its management. If you look at the number of commercial building sold/leased in the general area, I'm betting Dexter is right there near the top...perhaps Pittsfield Township is #1...but Dexter is small town. I guess the by product of nice economic growth is....Subway. The old Cottage Inn just sits there as well. We heard that they were going to build a 3 story building where the Cottage Inn and the older house next door sit. But that was maybe 3 years ago. That doesn't sound like something I would like to see there though. Just my opinion. Really, another Subway? While I would love to have another family friendly, sit down restaurant in town, I'd rather have a Taco Bell than another Subway. I have heard that the landlord at the Country Market shopping center is hard to deal with. And that parking lot is always in shambles. It's a shame we can't get a Barnes and Noble in that huge open spot on the end! Or a Jolly Pumpkin restaurant! Ahh, a girl, can dream. Tue, Jan 17, 2012 : 6:49 p.m. I would like to see a Mexican restaurant in that spot. Maybe a spinoff from the great one in Adrian (The Grasshopper). Tue, Jan 17, 2012 : 2:14 p.m. Does A2dotcom get a kickback from every new Subway they promote with these articles? Tue, Jan 17, 2012 : 7:34 p.m. Probably just more noticable as more Subways seem to open in these parts than any other franchise. Tue, Jan 17, 2012 : 7:16 p.m.
A2.com seems to report on all restaurants, shops, and chains equally. I'm pretty satisfied with the coverage, and I do want to know about all of them. If you can show that they give more coverage to SubWay than others, then back up your remarks. Tue, Jan 17, 2012 : 2:11 p.m. The pet store chain chooses to spell its name Wags to Wiskers. Seriously. For accuracy's sake, this article probably ought to use the owners' chosen name of the store . . . spell-checker and common sense be damned. Tue, Jan 17, 2012 : 10:24 p.m.
Tue, Jan 17, 2012 : 5:38 p.m. Yes, let's contribute to more illiteracy! Tue, Jan 17, 2012 : 1:22 p.m. Seriously??? I agree we don't need another SubWay. There is one on the West side of town and one on the South side of town. Granted they are tied into the gas stations but we don't need another. Didn't the corporate office let the franchisee know this? Why did they allow it? Nothing that can be done now as it is a done deal, I hope it is successful. Tue, Jan 17, 2012 : 7:14 p.m. Apparently the good people of Dexter are supporting those existing SubWays very well. Tue, Jan 17, 2012 : 2:42 p.m. I dont care what the Subway looks like inside. If I want to eat my sandwich inside, right after it is made, and in my opinion tasting the best a Subway sub could possibly taste, does it matter to you? I am glad you pick up your subs and take them home, sometimes I do that as well. My point was it will be nice to actually have one with seats, where if I want to sit, I can! Let the market decide if Subway makes it or not in the new location. Would you prefer for them to fail or do well? It's a business that will create jobs, tax revenue, and fill a vacancy in a shopping center. I could care less about what they sell. Tue, Jan 17, 2012 : 2:22 p.m. Yes, nvragain, we do stop on our way home and pick them up and take them home. The ambience at a Subway sit down is akin to eating in a hard, cold brightly lit hallway. Or do you see more? Do you like to take your fresh toasted sub and drive back home to eat it everytime? I dont. Or do you sit at a pump and scarf it down? Hop in the cab with a friendly trucker? Wed, Jan 18, 2012 : 2:54 a.m.
Jeffindex: You're questions are valid and accurate. It is my understanding that the plaza across the street is not tenant friendly at all. Dexter Phamacy didn't move because of it, but rather, they were intending on building their own building, after the closure of the downtown location. However, the plaza has struggled attracting and keeping tenants due to high rents, and instability with the lease agreement.....so I've been told. We really could do without another Subway, it appears that Dexter is a magnet for pizza shops and subs :( Not to mention franchises. I will say that for the most part, Dexter strives to bring business in, and that is good for the community. Tue, Jan 17, 2012 : 4:55 p.m. The subdivision has a long and well publicized run of problems and the rumor is the buildings are not very wonderful. The plaza is not local friendly (terms will not allow any local charities on the property for fund raisers), the property buildings are unfinished inside, the landscaping is really poor, the buildings are poorly laid out for inviting people into the plaza. Bottom line, its ugly and too far from the road for a strip mall. Dexter Pharmacy moved out, look at their new building now - close to the road and parking for all, but more friendly. In my opinion, the property owner could do a lot to improve the place, but doesn't. Would you want a landlord like that? Tue, Jan 17, 2012 : 3:49 p.m.
@mariea2 You could say the same for the other side, too, as there is a large subdivision behind Country Market. Good point. That large corner space just sits there, along withe the old Dexter Pharmacy space now. Could be because of the large neighborhood behind the Busch's complex -- I know some folks that live there walk to those stores instead of trying to cross the busy street to Country Market. That's my question also. The complex across the street has far more parking, but far lower occupancy. Is the building poorly maintained? High rents? What's the deal? Tue, Jan 17, 2012 : 12:51 p.m.
Tue, Jan 17, 2012 : 5:44 p.m. I'll take Izzy's over Subway ANY day! Tue, Jan 17, 2012 : 1:26 p.m. Yes there are two subways already in Dexter. One is at a truck station gas stop 4 miles out of town, and the other is at a gas station in town. So not only are they not stand alone, they are stores within stores. Have you seen the size of a PotBellys? Not quite the same as a Subway. Have you seen how well Quiznos is doing?Company may be bankrupt in 3 years, probably not a good tennant. Izzy's hoagie shop, seriously? I bet a subway store does amazing in this location. I suggest you drive 15 minutes and get you a good $12 Dibellas, which are good subs, just very expensive. Tue, Jan 17, 2012 : 12:47 p.m. Economically speaking, Dexter is pretty hot right now. A lot of business and industry moving in. The village is extremely well run and business friendly. The empty space is unfinished - completely. I have heard the property management is not very town friendly either - notice you will never see any scouts selling anything or bell ringers, which kind of goes against the grain of Dexter. Busch's on the other hand, is very local friendly. Dexter Pharmacy also moved out, so that says a lot too. Dexter is also hot because of the excellent school system as well as being business friendly. Tue, Jan 17, 2012 : 2:17 p.m. If Dexter is so hot, why is the large corner space in the Country Market still empty years later. As someone else said, we already have two Subway's within a easy drive. I'm surprised the current Subway franchees aren't squawking about the close proximity.